Whether or not to give kids an allowance for doing chores is one of those personal parenting choices. Perhaps not quite as controversial as circumcision, breast or bottle feeding, or free range vs. helicoptering. But still a personal/family choice. I've had the discussion with my mom friends and I've seen it debated online. Everyone seems to land pretty firmly on one side or the other, for or against. Those who do NOT give allowance typically say it is because they feel their kids should have to contribute to the household they live in. They live there and should have to help maintain the home just because it's the right thing to do. They also point out birthday and holiday gifts of cash, feeling that is enough of their own money. I don't disagree with those things but, like it so often does, my opinion falls more in the middle, somewhere between yes and no. I do pay my kids for some of the chores they do, and I'll tell you why. 1. Reward - I reward myself when I feel like I deserve it, why not my kids? 2. Empowerment - So my kids can make some of their own purchasing choices. 3. Money Management - How are kids supposed to learn how to handle, save, budget and shop for things when they don't have any of their own money? 4. I didn't have children in order to have them do all the chores. I felt like my step-mother looked at me as her personal housekeeper when I was a kid. While of course kids should clean up after themselves, and learn how to clean a house, I just don't think they should have to do more than their fair share simply because you have the power to make them do so. I'm not saying those who don't pay allowance are doing that, it's just something that carried with me from my childhood; that I didn't want my kids to feel like that's all they're good for. 5. Kids don't have any other way to earn money. I keep track of the chores my kids do on our wall calendar throughout the month. They can see the check marks accumulate, I tally them up at the end of the month and then I pay them at the beginning of the next month. Each task is worth one dollar. 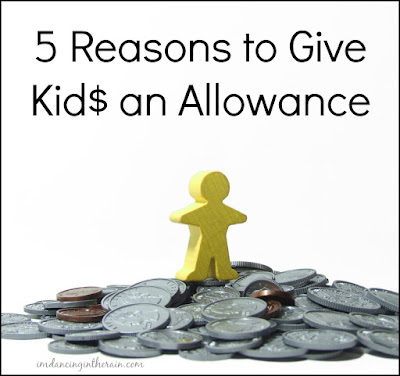 While I do dole out a little cash to my kids, I only give them an allowance for the things they do that contribute to the entire household. I do not pay them to clean their own rooms and I do not pay my teen to do her own laundry (nor my son to help with his). As far as simply being a nice, helpful person goes, there are still plenty of opportunities in any given day to ask my kids to go fetch something for me or their dad, to help with dinner, or to go get the mail, for which they don't earn money. Like most things, I just don't see it as a black and white/right or wrong issue. This is the way I came up with for our family, and I think it works for us. Where do you fall on this topic? Do you pay your kids an allowance?